Elvex Quattro™ industrial reusable ear plugs feature a stiff insertion stem and a tapered four-flange design to fit most users. Also available in uncorded. Elvex Quattro Reusable Ear Plugs Corded (NRR 27, SNR 34)4TanyaJune 4, 2016Fast delivery, comfy and priced well. Elvex Quattro Reusable Ear Plugs Corded (NRR 27, SNR 34)5JoeSeptember 26, 2015They seem to be the best fitting ear plugs I could find. They last about 2 months before they permanently compress to the shape of your ear, at which point it's too hard to get them them to seal to your ear. Elvex Quattro Reusable Ear Plugs Corded (NRR 27, SNR 34)4Bill HansonNovember 30, 2011I also picked up these plugs after my previous ones were lost by myself. Good fitting plug and easy to insert deep into my ear. 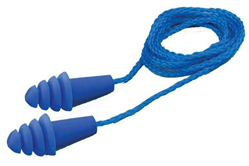 Elvex Quattro Reusable Ear Plugs Corded (NRR 27, SNR 34)5CliffMay 29, 2011They fit perfect, block out a lot of sound when pushed in, or push them in just a little and still be able to hear people talking, but blocks out the gun shots. Elvex Quattro Reusable Ear Plugs Corded (NRR 27, SNR 34)4DaveMay 17, 2011These fit my ears very well. I would recommend this product.